Publication on Abraham Fischler's paternal uncle Wolf Fischler and cousins: Fischler family, "A Anna et Wolf - A Tante Aline", s.l., 2009 [private publication]. Several members of the Fischler family have donated items to Kazerne Dossin, including the Schiff and Fischler families collection (KD_00025), and donations by Capi Fischler and Germaine Schraub-Fischler. Abraham Aron alias Bram Fischler was born in Oleszyce, Poland, on 11 March 1924, as the son of merchant Mojzesz Fischler (born on 10 July 1892 in Oleszyce) and his wife Serka Hollander (born on 27 May 1898 in Rudnik, Poland). Bram had an older sister, Sonia Laja (born on 19 May 1922 in Oleszyce), and three younger siblings, all born in Poland: Hudes alias Lisa (born on 1st June 1925 in Oleszyce), Beila Ruchla alias Rachel (born on 18 March 1927 in Oleszyce) and Munisz (born on 25 September 1929 in Oleszyce). The family was strictly orthodox. In June 1928 father Mojzesz Fischler migrated from Poland to Belgium. He settled in Borgerhout, Antwerp, and started working as a diamond trader. In September 1929 Serka and the children obtained their visa. After their arrival in November 1929, the boys were sent to the religious Jesode Hatora school. A third son named Jozef was born in Berchem on 30 September 1933. After graduating in 1939, oldest son Bram Fischler took further classes at the Commercial School in Berchem and was introduced into professional life as a diamond cutter while he kept on attending biblical school. In April 1940 the Fischler family settled in at their new residence at Bouwhandelstraat 23 in Borgerhout, Antwerp. The family still lived there when Nazi-Germany invaded Belgium on 10 May 1940. Three days after the invasion, on 13 May 1940, Abraham Fischler left home to make his way through France and Spain to Portugal, on foot, hitchhiking or by train. 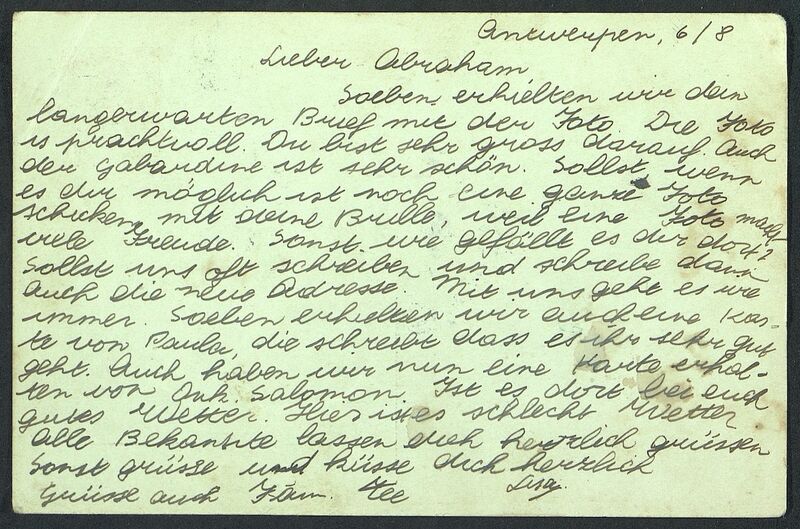 While in Portugal, Abraham communicated with his parents and siblings in Antwerp via postcards. Their messages contained every-day life details regarding sports, school results and new hairstyles, but also motherly advice regarding at which embassies Abraham should apply for visa. Since he was multilingual – Abraham spoke Portuguese, Dutch and Yiddish – he found a job on a ship sailing for Cuba in 1942. During the journey Abraham learned Spanish with elderly German refugees and served as a translator for passengers and crew. Upon arrival in Havana, he found a job as a diamond cutter apprentice and joined the diaspora of diamond workers, many of who were refugees from Antwerp. There Bram married Hana Lowy (born on 28 November 1926 in Antwerp), with whom he would have five children. After Abraham’s departure for Cuba at the beginning of 1942, all communication with his parents and siblings in Antwerp halted. When contact with Belgium was re-established in 1945, Abraham was only able to find his paternal relatives. He exchanged letters with his cousin Capi Fischler and a former neighbour who informed him about the arrest of his parents and siblings by the Nazis. Sister Hudes Fischler had presented herself with an Arbeitseinsatzbefehl, a convocation for forced labour, at the Dossin barracks and was deported via Transport III on 15 August 1942. She died in Auschwitz-Birkenau on 14 September 1942. Beila Ruchla also received a convocation but was exempted because of her age, Sonia Laja because of illness. However, the girls were not spared. Mojzesz Fischler, his wife Serka Hollander and their four remaining children – both girls, Munisz and Jozef – were arrested at home during the second large raid in Antwerp, in the night of 28 on 29 August 1942. The family was deported via Transport VII from the Dossin barracks to Auschwitz-Birkenau on 1st September 1942. Abraham Fischler and his wife returned to Antwerp in 1947 only to find Abrahams parents and siblings deported and murdered. Abraham would continue to look for his youngest brother Jozef for years as he presumed he had recognized him on a photo taken during the liberation of a concentration camp. Being one of the first diamond workers to return to Antwerp, Abraham Fischler became one of the most important initiators of the rebuilt of the Antwerp diamond industry. In 1953, Abraham together with his paternal cousins Aby and Capi Fischler, founded Fischler Diamonds Inc. Later on he became president of the Federation of Belgian Diamond Bourses, the Antwerp Diamond Bourse, the HRD and the World Federation of Diamond Bourses. Abraham Fischler passed away in 2003. He was survived by his wife, their five children and their grandchildren. Abraham Fischler, oldest son of Mojzesz Fischler and Serka Hollander, kept the postcards sent to him while in Portugal by his parents, siblings and friends from Antwerp, as well as all post-war documents regarding the fate of his relatives during the Holocaust. The originals were donated to Kazerne Dossin by Abraham Fischler's children.